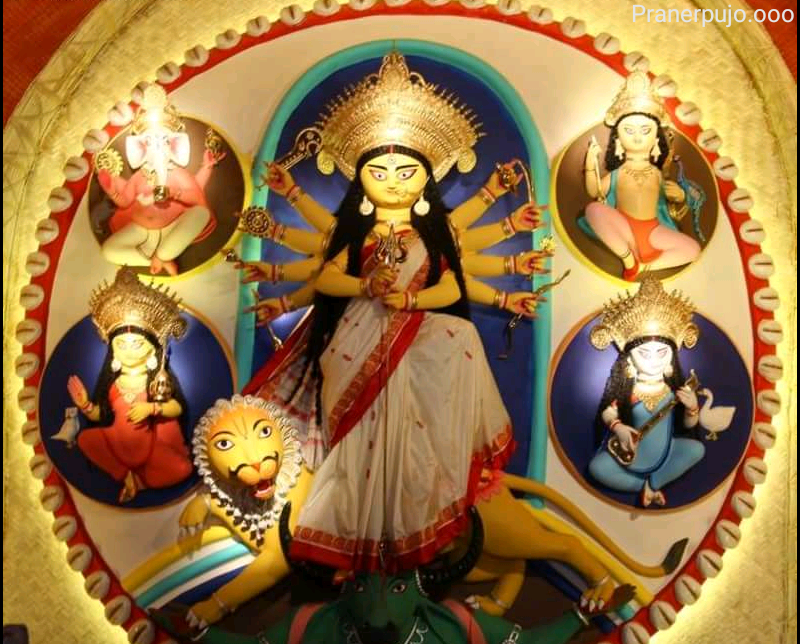 Durga Puja is celebrated on the 10th day of Durga Puja. On this day people wear new clothes and go to the fair. 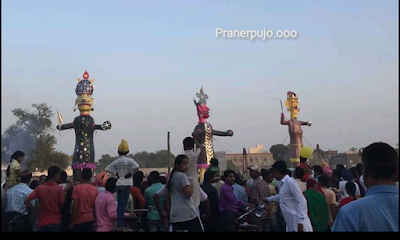 Kullu Dussehra of Himachal and Massaur Dussehra of Karnataka are famous, which are also seen from foreign countries. Durga Puja is also celebrated in the form of Navaratri in North India, in the form of Bomai Golu in Tamil Nadu and Bola Koluvu in Andhra Pradesh. 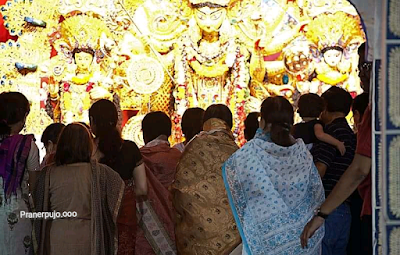 Dashwara, considered to be the 9th day of the mother's worship, and the 10th day, makes this whole festival special. From children to the elderly, the mother power is eagerly awaiting arrival. Navaratri is celebrated with great enthusiasm throughout the country. But in the west Bengal 5days are more special. The biggest attraction of Durga Puja is that of Durga Pandal. Here the statue of Mother Shakti is established by law and worship is celebrated for 9 whole days. The mother's feet open on the seventh day, after which people come to see the mother in these pandals. 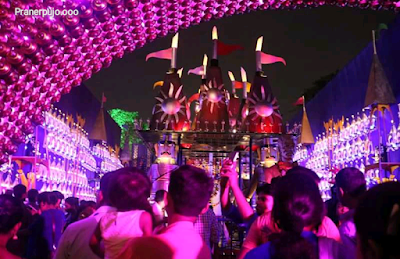 Not only idol but Pandal's designs are also the subject of discussion. Many worship committees then call out workers from outside and raise pandals on one subject more than one. During Navratri, 9 different forms of Durga are offered for different pleasures. After worship, it is distributed as a prasad. Many worship committees deliver large amounts of enjoyment. In the homes, people also offer homage to ghee, jaggery, coconut, malpua to the mother. Apart from this, those who practice fasting also take the Makhana kheer, dhunani, Sanghedade flour pudding, sorbet etc as fruitful and share the rest of the house. 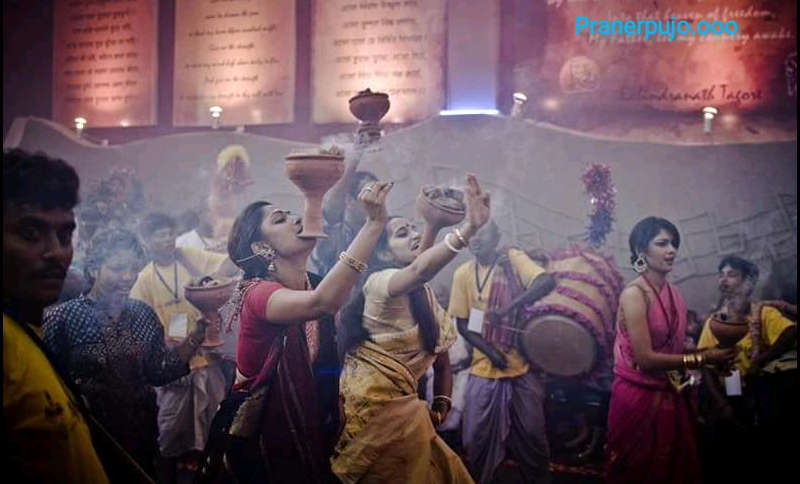 Dhunuchi dance is special in Durga Puja. Dhunuchi is a type of pot made of clay, in which coconut shells are burnt and mother's aarti is burnt. People take tunes in both hands, balance their body and dance. It is believed that for these 9 days the mother comes to her maiden. Therefore, tuning is done to make the atmosphere pure and happy by the joy of coming to them. These days Navratri's Dhoom is also spread all over the country. On the first day of Navratri, garba and pottery which are decorated with flowers and colorful fabrics, stars - is established. Then four flames are ignited in it and women keep clapping around it. In many places Garba dance is done before Mother Durga's Aarti. At the same time people dance dandisa after the arti. 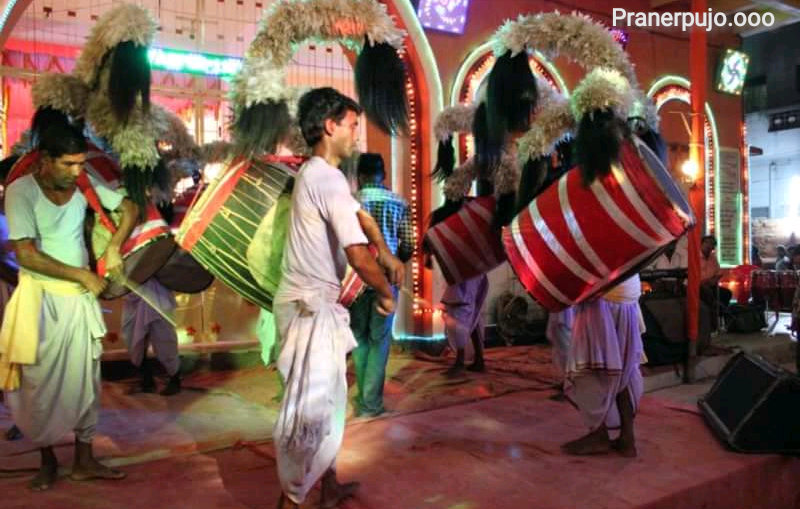 Durga Puja celebrations are incomplete without the noise of Dhak. Dhak is a kind of drum that is played in the honor of the mother during her aarti. Its sound is like a drum-dragon. 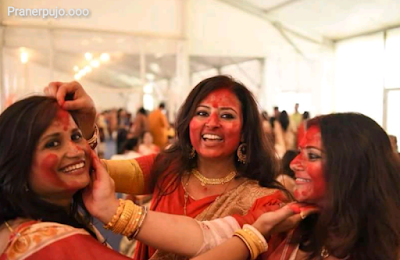 Well, this is a Bengali tradition, where women wear red sari sari during Durga Puja, but in this period of fashion, it is now worn in many parts of the country. Both Garad and Coral are white saris with red legs. The only difference is that the red border in the garard is broader than the choral and there are small flower motifs in the flower. During Navratri, especially Ashtami, people take flowers in their hands and sing mantras. Then give Anjali to the mother. In pandals, when on a large scale many people offer flowers to the goddess Durga, the view is worth seeing. On the last day of Navratri, married women, after worshiping the mother, use vermilion to each other. It says the vermillion played. 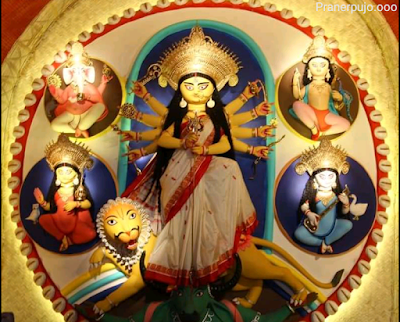 It is said that Mother Durga goes to her mother-in-law after departing, so her demand is filled. Pan and sweets are also eaten to mother. Seeing the tradition of playing vermilion, Holi remembers. After the Navaratri, the statue of the mother is immersed in the water on the tenth day. People danced around the streets and drove them off. 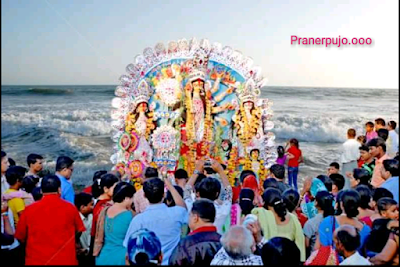 Dussehra is celebrated on the 10th day of Durga Puja. On this day people wear new clothes and go to the fair. Kullu Dussehra of Himachal and Massaur Dussehra of Karnataka are famous, which are also seen from foreign countries. This day is also known as Vijedashami because on this day, Mother Durga killed the glorious monster. On this day Ravana is also a tradition of combustion, because in Ram in Ram, he killed Ravana. In this symbolic fire, fireworks are placed in the idols of Ravana, Kumbhakarna and Meghnad, and the message of good victory over evil is given.